After the consecration of the Chapel on the Mount Jawor, the pilgrimages to this holy place have officially started. The two annual indulgence days, on 14th of October and 22nd of May, have then become the major feasts there. Those feasts gathered priests from the neighbouring parishes, and masses of faithful were coming in walking pilgrimages, led usually by church deacons, who are liturgical chant leaders during the eastern rite liturgies. The pilgrims from Czechoslovakia could be granted special permissions for participation in the celebrations in the Mount Jawor Chapel. However, they were obligated to return to their homeland immediately after the conclusion of the celebrations. The others were returning two kilometers back to the spa village of Wysowa, where they were already awaited by merchants from the nearby towns. Among the items sold there were different devotional articles and small jewelry, but most importantly sweets and sweet beverages, eagerly bought by some richer of the weary pilgrims. Before the World War II, there were more than two hundred and fifty houses in Wysowa, which made it one of the largest villages in the region. Since the beginning of the 19th century, Wysowa was gradually and very slowly developing as a spa, due to its springs of mineral waters, highly valued for their therapeutic properties. Due to the unfavourable location, far from the main communication routes, the therapeutic baths in Wysowa for a long time were only used by few. The situation significantly improved only in the end of the 19th century, when the number of visitors reached two thousand a year. Despite this growth, the majority of the local residents, Lemkos, were still occupied exclusively in agriculture. They lived their lifes plagued by scarcity, often resorting to migration to the United States, to sustain their poor households and provide support for their families. Nevertheless, much harder times were about to come. One Friday night in 1937 or 1938, during one of the weekly visions received by Firyja in her sleep, the Virgin Mary revealed the future to the poor widow: the hard time of the next great war and the cruel exile from the homeland. That vision was so terrifying that Firyja's daughter, Anna, awaken by her mother's screaming, in fear for her life, decided to interrupt it. In that unfinished vision, the Mother of God, besides the message about the coming war, warned that Lemko people would be expelled from the land that belonged to them for ages, and that they would be widely dispersed by enemy in a hostile environment. The Chapel was to survive, however, abandoned and devastated. The vision seemed nearly apocalyptic to the people who, though familiar with the hardships of war, couldn't even imagine the upcoming exile. However, the prophecies were soon to be fulfilled. Having reached the age of 58 years, Glafiria completed her earthly pilgrimage at the Easter time, on 21 April 1939, in accordance with the prophecy given her by the Virgin Mary. After the outbreak of war, already in early 1940, deportations to forced labour camps in Germany started. Among all Carpatho-Rusyns, they mostly affected Lemkos as those who didn't start collaboration with Germans. The next predicted plague and fulfilled prophecy were relocations to the eastern regions of Ukraine. At the instigation, and often under blackmail of communist agitators, some families (usually those not owning independent farms) left their homeland and departed to unknown areas. Some of them managed to return later, having experienced the misery of their new "promised land". The work of destruction has been completed in 1947, when almost all Rusyn inhabitants of the mountains were forcibly resettled to the territories of Western Poland. Thus, within the period of about ten years, all the future that had been revelaled to Firyja became fact. And the Chapel of the Protection of the Mother of God was remaining under the sole protection of... the Mother of God. Only a handful of Greek Catholics remained in Wysowa. Moreover, the new atheist authorities prohibited approaching the border at a distance less than one kilometer, which was strictly executed. As a result, the Chapel became no longer accessible. The years were passing and only around 1955 that prohibition has been mitigated. Then the Firyja's daughter, Anna Okarma, the only one of the three siblings that managed to stay in Lemkovyna, departed from the town of Gorlice, almost forty kilometers away, to check on the condition of the Protection of the Mother of God Chapel. She remembered the words of her mother when she woke her up that night, almost twenty years ago, interrupting her terrifying visions of the coming war, resettlements and abandoning the Mount Jawor. With fear and uncertainty she went to the Holy Mount, hearing the words of the Virgin Mary, recalled in memory by her anxious conscience: "The Chapel will be partially destroyed". Having arrived on site, she found the door wide open. Filled with dread, she stepped over the threshold and stood petrified. There wasn't a single icon on the walls, and instead, in the middle of the temple's floor, a pile of ash - remnants of a bonfire! Having hastily removed the ashes, among half-burned frames of the chapel paintings she discovered that central icon which used to be hanging behind the altar, and whose example had been once brought from Staryi Sambir by the pious Firyja. On that icon, the image of the Virgin Mary was still intact above the waistline. The woman, crushed by her finding, took the saved piece away like a relic. Nowadays, we are mostly accustomed to evil, but just half a century ago, people's faith and sensitivity to acts of profanation were far stronger. This matter must have caused severe agitation. When one of the border guards, being under influence of alcohol, was bragging about having destroyed "the Rusyn Mother of God", he has been stigmatised in the Wysowa people consciousness with a mark of abhorrent disgrace. During the period, when the access to the one kilometer wide border zone was available only to the border guards, the Chapel served as a guards shelter. Antireligious and Anti-Rusyn communist propaganda depraved some people so much that they became capable of acts of impiety which they considered glorious. Soon after, already in 1957, twelve Lemko families managed to overcome multiple obstacles and return to their home village of Wysowa. Their properties, left there ten years ago, were irrevocably lost. They had been taken long time ago by Polish mountaineers from the neighbouring areas as well as from the Tatra Mountains. Their lives had to be organized anew. 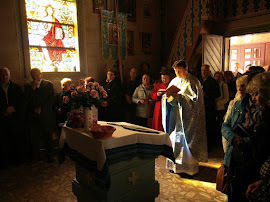 However, a little joy has been sparked in the hearts of the faithful - Anna Okarma brought the saved icon of the Virgin Mary to the previously prepared Chapel of the Protection of the Mother of God. Two weeks after the return of the first twelve families, in late fall of 1957, a symbolic event occurred. Above the place where the Chapel stands, a glow appeared. Thoughts about fire came involuntarily, as the image of destruction from the period of resettlements was still quite alive in people's memory. The next morning people came spontaneously to the Mount Jawor, to see what happened to the Chapel. To everybody's surprise, the temple remained intact. Only then it became obvious that in this miraculous way the Mother of God revealed Her presence, care, and persistence with the people returning from exile.